VANCOUVER, CANADA — Matthew Hornor, President and Chief Executive Officer of Kaizen Discovery Inc. (TSXV: KZD), is pleased to announce that Kaizen has successfully completed the acquisition of West Cirque Resources (TSXV: WCQ) in an all-share transaction. Under the terms of the acquisition, originally announced April 16, 2014, each West Cirque shareholder received one-half of one Kaizen common share for each West Cirque common share. Now that the transaction is finalized, former West Cirque shareholders hold approximately 14.7 million common shares, or 9.9%, of the approximately 148.6 million outstanding common shares of Kaizen. West Cirque's common shares ceased trading on the TSX Venture Exchange today following the completion of the transaction. West Cirque is a Vancouver-based mineral exploration company controlling seven prospective copper-gold porphyry exploration projects in British Columbia, Canada -- two of which are subject to an earn-in agreement with Freeport-McMoRan of Canada Limited. "We are extremely appreciative of the strong support we received from both Kaizen and West Cirque shareholders in completing the transaction," said Mr. Hornor. "We look forward to leveraging the strengths of the two companies and pursuing a systematic and aggressive exploration program and continuing to build shareholder value." "The combination of Kaizen's existing portfolio of exploration projects in Australia and Africa, and West Cirque's portfolio in Canada, establishes a stronger company with an impressive and diverse pipeline of projects," Mr. Hornor added. "Now that the transaction has closed, we can begin immediately working at Aspen Grove and work towards unlocking the potential of this exciting property." ITOCHU Corporation, a leading Japanese trading house, holds a 5.7% stake in Kaizen. A framework agreement entered into between Kaizen and ITOCHU in January 2014 established a collaborative working arrangement under which both companies can evaluate opportunities to explore and develop selected, high-quality, international mineral projects. Based on the signed framework agreement, ITOCHU has the right of first offer to enter into projects introduced by Kaizen. Kaizen is in advanced and detailed discussions with ITOCHU with regard to ITOCHU's expected participation in West Cirque's exploration projects. 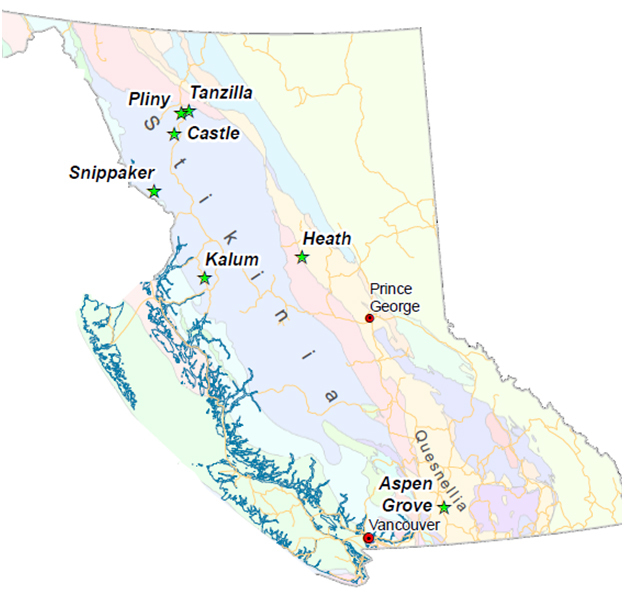 Since 2011, West Cirque has been focused on advancing porphyry copper-gold prospects in British Columbia's main porphyry belts, the Early Mesozoic arcs of the Stikine and Quesnel terranes. In 2013, West Cirque partnered with Freeport-McMoRan of Canada Limited to explore three projects in northern Stikine terrane --Tanzilla, Pliny and Castle. In southern Quesnel terrane, West Cirque has acquired a large land position in the Aspen Grove copper belt, located halfway between the Highland Valley and Copper Mountain mines. Initial exploration of the Aspen Grove project in 2013 resulted in discovery of a significant porphyry copper-gold target at the Par prospect. Kaizen is a Canadian technology-focused, mineral exploration company that was formed in late 2013 through a combination of Concordia Resource Corp. and assets acquired from HPX TechCo Inc., a 100% owned subsidiary of High Power Exploration Inc. With its collaboration agreement with ITOCHU Corporation of Japan and access to HPX TechCo's proprietary geophysical technology, Kaizen's long-term growth strategy is to work with Japanese partners to identify, explore and develop high-quality mineral projects that have the potential to produce and deliver minerals to Japan's industrial sector. Statements in this press release that are forward-looking statements are subject to various risks and uncertainties concerning the specific factors disclosed here and elsewhere in Kaizen's periodic filings with Canadian securities regulators. When used in this press release, words such as "will, could, plan, estimate, expect, intend, may, potential, should," and similar expressions, are forward-looking statements. Information provided in this document is necessarily summarized and may not contain all available material information. Forward-looking statements may include, without limitation, statements regarding the completion and expected benefits of the proposed transaction and other statements that are not historical facts. Forward-looking statements are based on a number of assumptions and estimates that, while considered reasonable by management based on the business and markets in which Kaizen operate, are inherently subject to significant operational, economic and competitive uncertainties and contingencies. Although Kaizen have attempted to identify important factors that could cause actual results, performance or achievements to differ materially from those contained in the forward-looking statements, there can be other factors that cause results, performance or achievements not to be as anticipated, estimated or intended. There can be no assurance that such information will prove to be accurate or that management's expectations or estimates of future developments, circumstances or results will materialize. As a result of these risks and uncertainties, the proposed transaction could be modified, restricted or not completed, and the results or events predicted in these forward looking statements may differ materially from actual results or events. Accordingly, readers should not place undue reliance on forward-looking statements. The forward-looking statements in this press release are made as of the date of this press release, and Kaizen disclaims any intention or obligation to update or revise such information, except as required by applicable law, and Kaizen does not assume any liability for disclosure relating to the other company herein.